This card with the Seasonally Scattered stamp set, was probably the most work out of all the cards. I hand cut out the "thanks" with an exacto knife and scissors and got the exact look I was going for! I really love the way the Tangelo Twist pops against the Coastal Cabana. 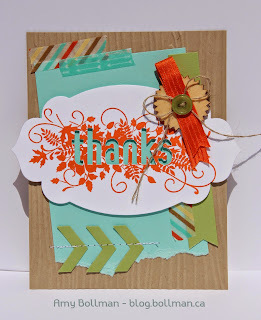 The colors on this card are Crumb Cake, Coastal Cabana, Tangelo Twist, Whisper White & Pear Pizzazz. WOW! What a cool idea and effect!